Whether you're exploring your own backyard or passing through from elsewhere, Ontario is a fantastic place to be during the fall. There's enough natural beauty and cultural happenings to satisfy the entire traveler spectrum, from outdoors-oriented folk to those who prefer the urban locales. By no means is the following list a complete one; consider it the tip of the iceberg when it comes to top notch Ontario fall destinations, because the possibilities are endless in this 1.08-million square km province. Why, you ask, would one be compelled to visit this particular geographic corridor, known primarily for being the closest thing Canada has to a Silicon Valley, in the fall? To celebrate Oktoberfest, of course! Strangely enough, the largest annual Oktoberfest celebration outside of Germany resides in the Kitchener-Waterloo area. It is a nine-day festival filled with sausages, beer (but it's still family friendly! ), and all sorts of other Bavarian revelry. Overlapping with Thanksgiving, the celebration includes a parade on the holiday Monday that regularly draws well over 100,000 attendees. Though it sounds like it would be located in Quebec, Frontenac Provincial Park is most definitely an Ontario destination. It lies just north of the city of Kingston, making it fairly accessible and not too far of a drive from the 401 highway. Aside from the beautiful natural splendor that any provincial park would offer, Frontenac is unique in the sense that it has a neat fall wrinkle to it. Visitors are encouraged to attempt the Frontenac Challenge, a test that was devised about 25 years ago by Park Superintendent Lloyd Chapman. If a participant successfully hikes each of the 11 loops in the Park's trail system, then he or she is presented with a certificate of accomplishment at the Frontenac Challenge celebratory BBQ, which takes place in November. For anyone coming from Toronto, getting to Vaughan doesn't require much of a drive. In fact, the city of Vaughan literally borders the central north edge of Ontario's capital. Vaughan as a whole isn't necessarily a place that draws tourists in—much of the municipality consists of suburban-style homes and strip plazas—but there are a couple of sites that absolutely make it a worthwhile destination to visit. The first is the McMichael Art Gallery, which can be found in a Vaughan village called Kleinburg. It is one of the rare galleries that is almost entirely devoted to a highly specific set of artists; in this case, the Group of Seven. Known for producing some of the most stunning artistic representations we have of Canada and painting them in a highly specific style, the Group of Seven's work is not to be missed. The nearby Kortright Centre for Conservation is also worth a walk—especially in the fall—when making a visit up to McMichael. After (or before) that, take a trip down to Black Creek Pioneer village, a live action recreation of what it was like to live like the Canadian pioneers did. In crisp fall weather, it makes for the perfect daytime outing. Parry Sound is one of many quaint towns in the Georgian Bay region. What makes it extra special to visit in the fall is its stunning lookout, Tower Hill. The 30-m high observation tower gives onlookers a clear view of the entire town, the colourful foliage surrounding it, and the vast bay, which stretches all the way out into Lake Huron. Aside from soaking in the views, Parry Sound visitors can amuse themselves by perusing the town's gift and specialty shops, touring the Bobby Orr Hall of Fame, and exploring nearby Provincial Parks like Killbear and Massassauga. Not far from the city of London, Ingersoll is a southwestern Ontario gem that often goes easily overlooked, despite its proximity to the 401 highway. Most of the year its biggest attraction is the Ingersoll Cheese & Agricultural Museum, but in fall, that gets temporarily usurped by Leaping Deer Adventure Farm & Market. Leaping Deer is like a fall-themed wonderland for kids. 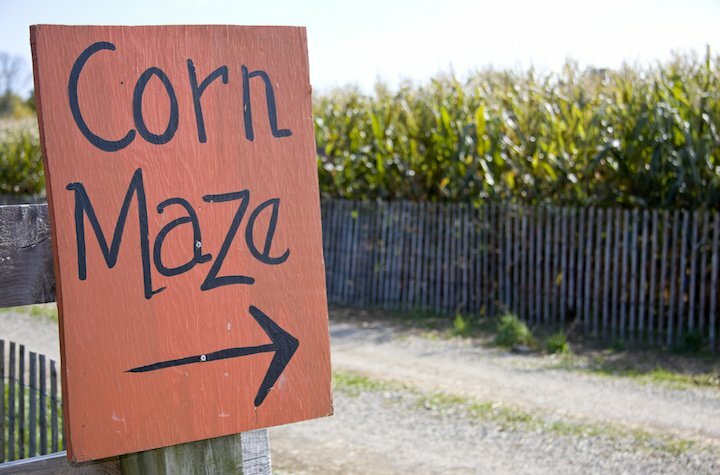 With activities like a massive corn maze, animal viewing/petting, wagon rides, mini-golf, chicken chuckin (with a rubber chicken, of course), and much more, it certainly won't leave the young'ns disappointed. And if adults haven't been having fun already—which they really should be—there's also a farming museum and country store full of succulent home-baked products.